The tables are set, and so is the stage. After a gap of seven years, India is thrilled to be hosting an ITTF World Tour event, this time with glamorous, state-of-art facilities at the Thyagraj Sports Complex in the city of New Delhi. 11EVEN SPORTS Private Limited, a company exclusively formed for the promotion and development of table tennis in India is the face behind a new improved look of the India Open. Kamlesh Mehta, Director of 11EVEN SPORTS spoke exclusively to the ITTF on their mission to transform the game in India. For the next six days, 80 such champions will be seen in action at the Thyagraj Sports Complex in New Delhi, the home of world class table tennis action in India, a heaven for the table tennis players and fans, and treat to watch for the Indians. The arena comprises of four tables, with a jaw-dropping in stadia look that table tennis in India has never seen before. Kamlesh Mehta, an eight time Indian national champion in the eighties and nineties and now the Director of 11EVEN SPORTS, the company that is organizing the tournament, is a proud man. “11EVEN SPORTS, the name itself indicates table tennis- a game is up to 11 points, that’s why the name. Our aim is to take table tennis to the next level in India,” he emphasized. The website clearly states the mission: To popularize the sport of Table Tennis across all segments of society – from Schools to Corporates, Amateurs to Professionals, Rural to Urban. Their vision: To produce sporting champions who will represent our Country (India) at Olympics and other global sporting events. “Today India is not a strong table tennis nation as far as attracting the top international players is concerned. We are here to change the perception of the world towards India, with an aim to bring the top table tennis talent to our country in the future.We welcome the world with open arms to India.” explained Mehta. “We are happy that the ITTF has given us the opportunity to host this prestigious event. We initially bid for the India Open to be the World Tour Platinum event, but the ITTF wanted to test us. We are confident that we will put up a good show at the Seamaster 2017 ITTF World Tour India Open and in future host a Platinum series event as well.” – Kamlesh Mehta, Director, 11EVEN SPORTS. The brainchild of 11EVEN SPORTS is Mrs.Vita Dani, a passionate promoter of various sports in India. The owner of Chennaiyin F.C., a football club in the Indian Super League, Mrs.Dani is married to the owner of Asian Paints, India’s leading and Asia’s fourth largest paint company, with a turnover of Rs. 158.5 billion. “The kind of hard work and passion that she has displayed, motivates us to work harder as table tennis enthusiasts,” said Mehta. “A short format league is successful in other sports, then why not in table tennis. The Indian Table Tennis League, scheduled from 8th to 30th July 2017, is a franchise based league that will attract top international and Indian players, with the aim to promote sport at a higher level,” explained Mehta. 11EVEN SPORTS is the rights holders for the upcoming league which has already created a buzz at the international level. True development of any sport comes from the grassroots and 11EVEN SPORTS is determined to make that possible. “Our schools program will work with young kids. The National Inter School Table Tennis Championship will be the key for its success,” said Mehta. The model requires that all Indian states affiliated with the Table Tennis Federation of India organize a state level tournament, open to all schools in a particular state, which will be played in four categories- junior boys, junior girls, senior boys and senior girls. In all states, this tournament will be held on National Sports Day of India, i.e., 29th August. Four teams of each state will qualify for the national championship to determine the final winners. 11EVEN SPORTS will be funding this mass tournament and their efforts will make sure that all children across all Indian states play table tennis on India’s National Sports Day! 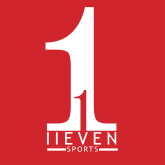 The logo of 11Even Sports. Apart from this, 11EVEN SPORTS will also organize table tennis events at the corporate level. Additionally, they will be the title sponsors for all Indian national ranking tournaments. ”We believe a strong federation will improve the administration which will in turn make a difference in the overall level of Indian table tennis,” clarified Mehta. With 11EVEN SPORTS taking charge of revamping the sport of table tennis in India, the future of the game is in safe hands. For the next six days, the world will witness what 11EVEN SPORTS envisions. A nation of 1.3 billion people awaits the magic.